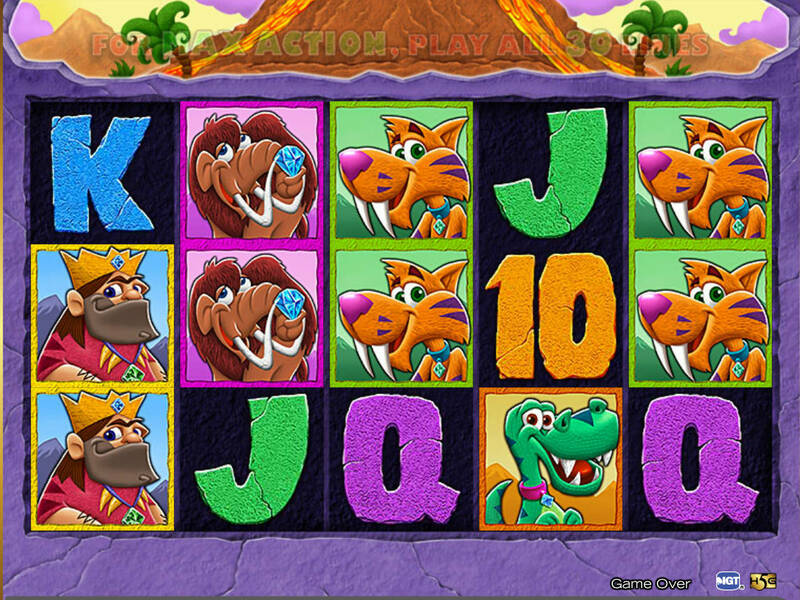 Cave King slots game allows players to make small bets or go for large stakes, depending on what type of mood they are in, or how much they are willing to spend. The Cave King is a 30 line online slots game, and players are able to play 1 line, or multiple lines combinations, such as 5 lines, 9 lines, 15 lines, or the maximum 30 lines. The minimum bet per line for this game is 0.01 coins, while the maximum bet is 10 coins. This means that the maximum bet for a single spin can go as high as 300 coins. Playing the game is quite easy, and players can quickly figure it out as they go along. However, knowing a little bit about how the game works will get you off to a flying start. For instance, if you are able to find from 3 to 5 matching number or letter symbols, such as the 9, 10, J, Q, K, or A, you can earn a win of between 5x and 100x your stake for that spin. There are some other symbols that pay even better than these number and letter symbols. The woolly mammoth symbols for instance, will payout 100x your stake. If you are able to land 5 of the saber tooth tiger symbols, this will result in a win of 150x your original stake. 5 dinosaur symbols on the other hand, will payout 250x your stake, and so can result in some sizeable winnings. If there is one symbol to aim for in Cave King Slots, these are the King’s 5 wives. If you are able to land these 5 symbols, the Cave King will payout 750x your stake. So players should do their best to get these symbols to line up. However, because this game is down to chance, luck will really have to be on your side to be able to win this enticing jackpot. At certain times, the Cave King symbol will go wild. When this happens, these symbols will replace many of the other symbols on the reels, which can in turn create extra winning combinations. In addition to the standard version of the game, if the Crown symbols appear on the playing reels, the Crown Bonus game will be activated. The principle behind this bonus game is that the more symbols that have appeared on the reels, the more chances there are of winning bigger real money pokies prizes. As with many other modern online slots games, Cave King slots does offer free spins to players. If a player is able to land three bonus symbols, this will trigger 7 free games. Four symbols will result in 10 free games, and five symbols results in a total of 15 free games. While using free spins, players will also be awarded with a Harp symbol. This symbol is able to set a prize multiplier at 2x, 4x, 5x, or even as high as 10x. Theoretically, this means that you might have the chance of winning up to 30,000x your stake for that spin.